Respiration in frozen soils is limited to within the thin water films surrounding soil particles. We parameterize volumetric water content (VWC) in frozen soil to represent the fraction of thawed carbon to simulate substrate availability. Simulated VWC and respiration match in situ and soil incubation data. The parameterization is most applicable when simulating carbon dynamics in permafrost for time scales of 100 years or greater. We investigate the properties of soils and sediments in a particular and ancient Siberian permafrost landscape. We critically examine statements from a recent study that specific permafrost landforms affected by thawed permafrost (alases) in this region contain very large quantities of peat that previous studies had failed to include because of data set biases. We conclude that there is no evidence to suggest biases in existing data sets or that alas deposits increase the northern peatland pool. A comparison of eight hydrodynamic-oxygen models revealed that while models have difficulty resolving key drivers of dissolved oxygen (DO) variability, all models exhibit skill in reproducing the variability of DO itself. Further, simple oxygen models and complex biogeochemical models reproduced observed DO variability similarly well. Future advances in hypoxia simulations will depend more on the ability to reproduce the depth of the mixed layer than the degree of the vertical density gradient. A micrometeorological method (REA) has been implemented to assess the role of cereal crop fields in the North China Plain as a source or sink of elemental mercury vapor (Hg0) during the course of a full year. In combination with chamber measurements under the canopy, the above-canopy REA measurements provided evidence for a balance between Hg0 ground emissions and uptake of Hg0 by the crop foliage, with net emissions prevailing from the ecosystem during the majority of a year. The oxidation of ammonia by microbes has been shown to occur in diverse natural environments. However, the link of in situ nitrification activity to taxonomic identities of ammonia oxidizers in high-temperature environments remains poorly understood. Here, in combination of culture-independent and culture-dependent approaches, we provide direct evidences that ammonia-oxidizing Archaea (AOA) are indeed responsible for the major portion of ammonia oxidation in high-temperature hot springs. This paper presents the first global fuel data set, containing all the parameters required to be input in the Fuel Characteristic Classification System (FCCS). It was developed from different spatial variables, both based on satellite Earth Observation products and fuel databases. This data set could be used for different applications, including fire danger assessment, fire behavior estimations, fuel consumption calculations and emissions inventories. Drifting sediment traps were deployed in the oxygen-deficient waters of the Arabian Sea, where the sinking flux is less attenuated than in more oxic waters. Six mechanisms that might explain this "enhanced flux" were evaluated using literature and data. In the upper 500 m, evidence was found supporting an oxygen effect and/or changes in the efficiency of the microbial loop, including the addition of chemoautotrophic carbon to the sinking flux. 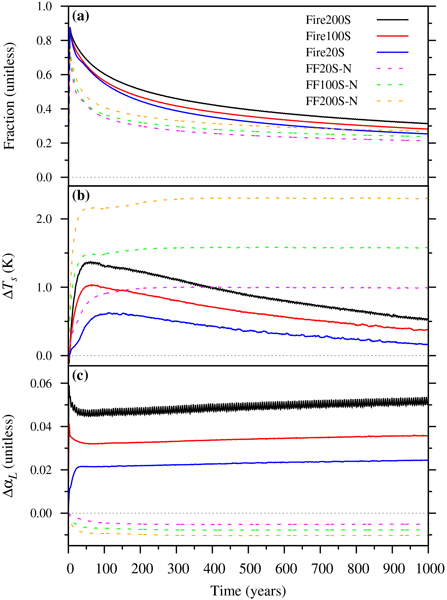 This study examines an inversion approach for estimating Q10 and depth of production using a physically based soil model, constrained by observed high-frequency surface fluxes and/or five concentrations. Inversions using exclusively surface flux measurements were successful, but using multiple shallow subsurface CO2 measurements yielded the best results. This work is a first step toward building a reliable computing framework for removing physical artefacts from high-frequency soil CO2 data. The soils of the permafrost region are estimated to hold 1100 to 1500 billion tonnes of carbon. As climate change progresses much of this permafrost is expected to thaw and the carbon within it decay. Here we conduct numerical experiments with a climate model to estimate with formal uncertainty bounds the release of carbon from permafrost soils. Our simulations suggest that the permafrost carbon will make a significant but not cataclysmic contribution to climate change over the next centuries. We simulated both fire pulses and stable fire regimes and found the resulting climatic impacts to be irreconcilable with equivalent amounts of CO2 emissions produced by fossil fuel combustion. Consequently, side-by-side comparisons of fire and fossil fuel CO2 emissions—implicitly implying that they have similar effects—should be avoided. Our study calls for the explicit representation of fire in climate models in order to improve our understanding of its impacts in the Earth system. The ocean absorbs atmospheric carbon dioxide (CO2) which increases the concentrations of CO2 and decreases pH in a process called ocean acidification. Because seagrass rely on carbon for photosynthesis they are expected to benefit under future ocean acidification. We manipulated pH in a Posidonia oceanica seagrass meadow. Seagrass traits, photosynthesis, and growth were not affected. Any benefit from ocean acidification over the next century on Posidonia physiology and growth may be minimal. Seasonal dynamics of tropical forest productivity remain an important source of uncertainty in assessments of the land carbon sink. This study confirms the potential for canopy structure and illumination geometry to alter the seasonal availability of light for canopy photosynthesis without changes in canopy composition. Our results point to the need for 3-D forest structure in ecosystem models to account the impact of changing illumination geometry on tropical forest productivity. A comparative analysis of the metagenomes from two 30,000-year-old permafrost samples, one of lake-alluvial origin and the other from late Pleistocene Ice Complex sediments, revealed significant differences within microbial communities. The late Pleistocene Ice Complex sediments (which are characterized by the absence of methane with lower values of redox potential and Fe2+ content) showed both a low abundance of methanogenic archaea and enzymes from the carbon, nitrogen, and sulfur cycles.